The 2009 re-run of David versus Goliath may not have included the slingshot prop of the biblical bout, but the Russian world heavyweight champion, Nikolai Valuev, was felled using the same approach as that which downed the talismanic Philistine: brains outwitted brawn. Haye stuck to his game-plan in defeating the one-dimensional Valuev. David Haye gave away more than seven stone to WBA titleholder Valuev, but though much had been made of the difference in bulk between the two boxers beforehand, when fight-night came, challenger's game-plan ensured he became the first British heavyweight champion since Lennox Lewis with ease. Comfortable and relaxed from first bell to last, it is even more remarkable and demonstrative of the rising star of Haye that the former cruiserweight champion secured a points win with a right hand that had been broken in the second round. Valuev's technique was shown to be slow and one-dimensional. Though the 36-year-old had a fearsome reputation, his straight left jab was his only means of meaningful attack, and when Haye showed that pinning him down with such a blunt instrument would be like trapping oil with a colander, Valuev was left stumped and without a plan B. 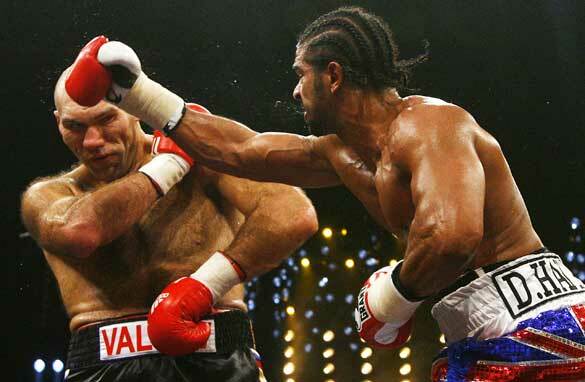 The 29-year-old Haye was so effective at avoiding the line of attack from the "Beast from the East" that Valuev was left groping the shadows and spaces the Londoner's lean shape had left in the air prior to moving, a recurring event that morphed the aura of Valuev from fearsome colossus to bemused behemoth in a matter of rounds. Haye stuck to the script - to hit and not be hit - slipping and sliding around the slow-motion Russian before returning fire with well-placed hooks and humdingers. Prior to the fight, much of the talk was whether Haye would be able to go the distance if required, but in truth the Briton finished with energy to spare, saving the most bombastic combination for round 12. If fights were still fought over 15 rounds, it was hard to see any other outcome than more punishment for the now lumbering giant, Haye's lifetime dream was minutes away from being realized. Once crowned, Haye admitted the bout had gone as he had hoped: "I had to make him miss so much that he started thinking twice about what he was going to throw. Once that happened it gave me more room to do my thing." Haye must face America's John Ruiz in the mandatory defense of his newly-acquired crown for his next fight, but Vitali Klitschko (the WBC champion) has already said that, if Haye comes through unscathed, he is keen to fight to unite the belts. The victory secured in Nuremburg, Germany may ultimately only prove the first step in a career that will see the unification of the belts by a personality that could light up a division bereft of bums-on-seats characters, but if nothing else it proved once again that the little man can triumph over seemingly unbelievable odds with a little bit of thought. I was so happy for Haye. I didn't expect him to show that kind of style. I was so impressed with the 12th round. This was great the little underdog will always prevail!! To bro Haye;who followed his dream and had the heart and faith to believe in God.When you believe in yourself and that chance is standing right in front of you and the only thing is stopping it;is you than you shall have it.To bro Haye please! stay humble and dont let the world change you into something else,because the world loves nobody,but (green paper).I will be praying for you in Jesus Christ name and you shall be ok! because I've ask.I am sooo proud of you so be the very best that you can be and make your money work for you now,because youre now living the dream. Do his thing?What an ignorant fool. this was the worse fight i ever seen. that hayes joker made me sick, can anyone say BOREING!? the russian guy looked like he drank a wee bit to much vodker if you asking me. david haye talked to much trash talk to, him made me sick. he didnt even not back it up, so if ur gonna talk the talk at least walk the talk to. Why did you go for the young men Nikolai, I know you need money but some people need it more than you, please is better to stop boxing you are old now. Nikolai you are great but don't try the a young guys again. Congradulation Haye but Nikolia is still your father. Does ANYONE know how painful it is to fight with a broken hand??? I have broken my right hand twice, just to THINK of continuing a fight, Haye must be one tough hombre. Kudos mate!!! I say get an education. Become an electrician, a mechanic, a doctor, a lawyer — anything but a fighter. In this trade, it's the managers that make the money and last the longest. With that said congratulations to Pacquiao. Here's another piece of valuable information I found.